Wallace's hut was built in 1889 and is probably the oldest surviving hut on the high plains of north-east Victoria. It was built in six weeks by Irish immigrant brothers Arthur, William and Stewart Wallace among old snow gums on a grassy plain above the snowline. The brothers held grazing leases on the High Plains and the hut was built to provide shelter for the cattlemen working there. The timber was cut from the forest about four hundred metres east of the hut, and the hearth stone was dragged in from Pretty Valley. The chimney had a base of rubble and above this iron sheeting on a timber frame. The slab walls were lined with hessian and later with tar-paper, and inside there was a bush table, sleeping platform and a rustic fire-side settle. The hut was used by many local cattlemen, as well as stockmen from New South Wales, who brought sheep here during the 1914-18 drought. Many such huts were built in mountain areas, but they were flimsy structures, and at great risk from bush fires, and no others have survived from the nineteenth century. The State Electricity Commission used the hut from the late 1920s until the early 1940s to collect data on precipitation for possible future hydroelectric works, and SEC employee Joe Holsten covered the roof and later the walls with corrugated iron, renewed the chimney and added a skillion for storing firewood and horse feed. In the 1940s the Rover section of the BoyScout Association took over responsibility for maintenance and it became an important refuge and destination for walkers and skiers. This image belongs to the travel and nature stock photo library. This stock photo of Wallace's Hut at Sunset is available for licensing for commercial and editorial uses including websites, blogs, books, magazines, brochures and advertising. Restrictions may apply for images which contain third party copyrighted material or sensitive subjects. Photos of artwork are for editorial use only. 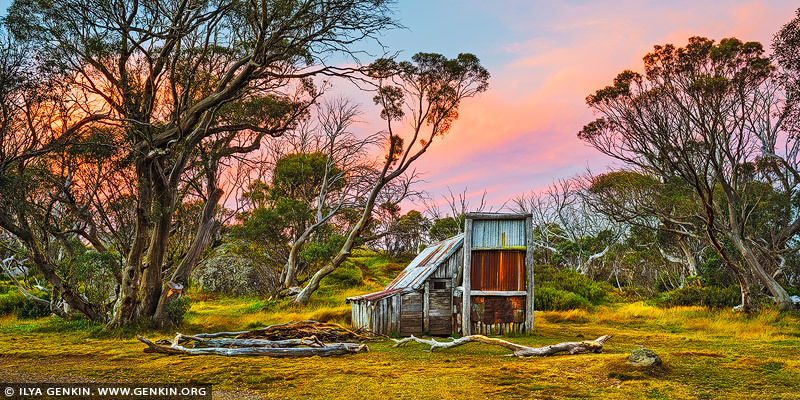 This image id AU-FALLS-CREEK-WALLACES-HUT-0004 of Wallace's Hut at Sunset, is copyrighted © by Ilya Genkin. This is not a public domain image.